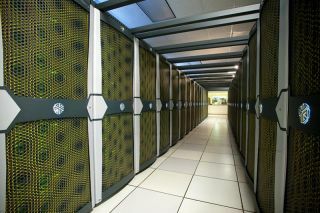 Pleiades, which ranks 7th on the TOP500 list of the world's most powerful supercomputers, represents NASA's state-of-the-art technology for meeting the agency's supercomputing requirements, enabling NASA scientists and engineers to conduct modeling and simulation for NASA missions. This distributed-memory SGI ICE cluster is connected with InfiniBand in a dual-plane hypercube technology. After a five-year drought that saw losses to rival computing superpowers American and China, Japan has again brought home the title of "world′s fastest computer." The "K Computer," built by Fujitsu and the Riken national laboratory, runs at 8.162 petaflops, or about 70,000 times faster than an X-Box. Despite this win, the U.S. still dominates the list, with Oak Ridge National Lab's Jaguar rig taking the number three post, and NASA′s Pleiades supercomputer landing the number seven spot. The rankings were announced today at the 26th International Supercomputing Conference (ISC'11) held in Hamburg, Germany. The rankings come out biannually, and the list released today recorded the first time that all of the world's ten fastest computers ran at a rate fast than one quadrillion calculations per second. The K computer is comprised of more than 800 computer racks with a total of 68,544 CPU. It achieved an extraordinarily high computing efficiency ratio of 93 percent, owing to the K computer's integration of technologies, including its massive number of CPUs, the interconnectivity that links them together, and the software that is able to bring out the highest performance from the hardware. The K Computer derives its name from the Japanese word "Kei," which refers to ten quadrillions, or the number of calculations per second that its creators hope it will eventually achieve. Ten quadrillion calculations per second, or 10 petaflops, remains the brass ring of super computing. With each of the top ten computers operating at over a petaflop, and with other top 10 fastest computers, such as NASA′s Pleiades computer, also aiming to eventually reach the 10 petaflop level, the race for world′s fastest computer looks tighter than ever. "I am delighted that we were able to achieve this result, made possible through the tremendous efforts of all involved, despite the impact of the Great East Japan Earthquake," said Michiyoshi Mazuka, Chairman and Representative Director, Fujitsu Limited. "In particular, I am sincerely grateful to our partners in the Tohoku region for their commitment to delivering a steady supply of components, even though they themselves were affected by the disaster. Bringing together hundreds of thousands of components to quickly launch such a massive-scale computing system-which would have been nearly impossible using conventional technologies-requires an incredible level of reliability."